Women's Handmade Silver Designer Ring : LOVE2HAVE in the UK! This women's handmade silver designer ring is the most popular of all the melted style silver jewellery we feature. 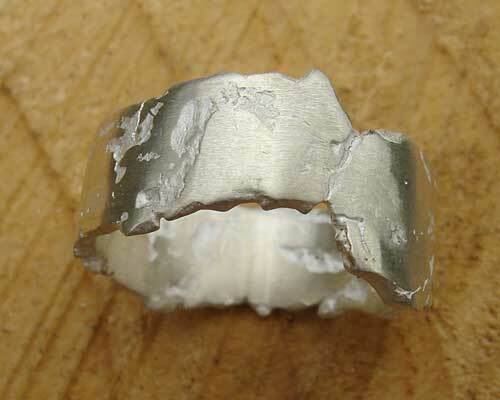 It is a silver ring that measures approximately 9mm in width, but do note the very rough wall shape, so this is only approximate. Like all the melted pieces it features the luscious chunky rock-like texture created by manipulating the silver in a molten state leaving deep scars and rock-like edges to the ring. After finishing the ring is polished so when you first receive it some white residue may be present on the surface. This whiteness will soon disappear. Please note that this jewellery is handmade so that each piece is unique and may differ slightly from the picture shown.